Description：The 2018 China-Latin America and the Caribbean (LAC) Media Forum kicked off in Buenos Aires on Monday to promote bilateral cooperation in the field. The 2018 China-Latin America and the Caribbean (LAC) Media Forum kicked off in Buenos Aires on Monday to promote bilateral cooperation in the field. The event, themed "Deepening media cooperation, contributing to building of a China-LAC community with a shared future," drew representatives from 13 Chinese media outlets and over a hundred news agencies from over 20 LAC nations. During the three-day forum, participants will exchange views on "the media's role in pragmatic cooperation between China and LAC" and "creating a China-LAC media communication platform through new media cooperation." The forum is an important event in the history of China-LAC media communication, and it is also a major event to enhance people-to-people exchanges between China and Latin America, Jiang Jianguo, deputy head of the Publicity Department of the Communist Party of China Central Committee, said at the opening session. "Cooperation between Chinese and Latin American media is a significant part of Chinese-Latin American cooperation, and represents an important force for promoting the construction of a community with a shared future between the two sides," the senior official said. He expressed the hope that media organizations will further strengthen exchanges and cooperation, jointly write a new chapter in China-Latin America cooperation, build a strong public opinion for friendship between the two sides, increase coordination in reporting world affairs and deepen pragmatic cooperation among themselves. The Chinese government will continue to support China-LAC media cooperation so as to constantly enrich the friendship between the two sides, said Jiang. The forum was jointly organized by China's Xinhua News Agency and Argentina's Federal System of Media and Public Content. News organizations serve as a bridge between different countries and civilizations, said Cai Mingzhao, president of China's Xinhua News Agency. Cai also put forward three proposals on the enhancement of China-LAC media cooperation. The first is to deepen cooperation on news reporting. "We propose that Chinese media go deeper into the marvelous continent of Latin America and also welcome LAC media to do interviews and exchanges in China," he said. The second is to enhance new media exchanges. Cai said Xinhua is willing to grant LAC colleagues access to "Live News Cloud," a live-steaming platform open to all media, and "Media Brain," a platform that uses artificial intelligence (AI), cooperate with LAC media in new media, and discuss the path of innovative development. The third is for LAC media organization to join the economic information alliance for the Belt and Road Initiative, which Xinhua is currently working on, he said. Hernan Lombardi, head of Argentina's Federal System of Media and Public Content, said that there is broad prospect for media cooperation between China and Latin America. Media organizations on both sides should work together to promote unity and boost efforts to build a community with a shared future for mankind. 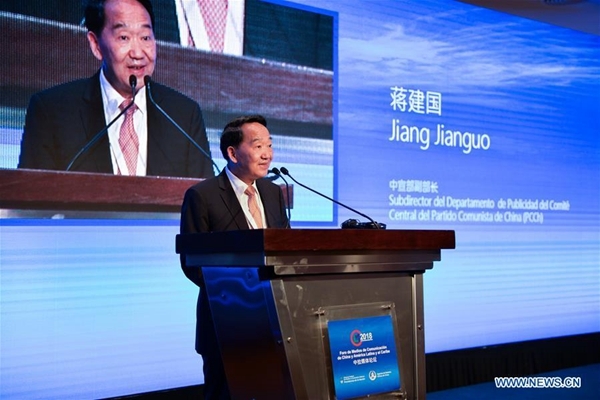 Fang Jiangshan, deputy chief editor of China's People's Daily, said that the active and friendly dissemination of information by Chinese and Latin American media has widened the bridge that connects the hearts of the Chinese and Latin American people, and injected new vitality into the China-Latin America relations. Media workers on both side should strive to become a driving force, an effective stabilizer and ballast for the China-Latin America community with a shared future, Fang added.